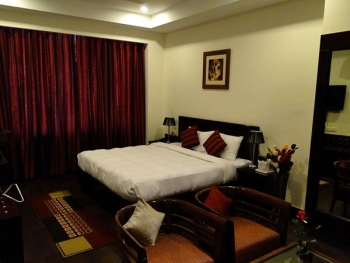 Hotel Hari Heritage, is an affordable 3 Star luxury sojourn in pious Haridwar, located on the uncongested Rishikesh Highway, just 10 Minute drive from Har Ki Pauri. As a perfect host to all of your social and business occassions, Hari Heritage has everything to make your evening perfect. The hotel is committed to provide best possible solutions for business conferences, seminars, exhibitions, social occasions include kitty party, marriage party, reception party, birthday party and theme parties with its state-of-the-art banquet hall, multi cusine restaurant and efficient supporting staffs. All Rooms are aesthetically designed to keep the luxury intact with great hospitality tradition. All Rooms provide the Raja Ji National Park thick Forest on back side and front side Rooms provide grand view of Shivalik Range and Bharat Mata Mandir as well as Chandi Devi Temple view. 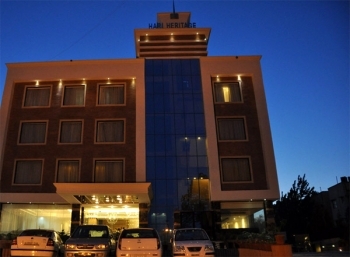 Hari Heritage hotel is located 10 minutes from Har Ki Pauri on the Haridwar-Rishikesh Road, opposite to world famous Shantikunj. Each room of the Haridwar Hari Heritage is designed and decorated keeping the taste of Haridwar’s eternal beauty in mind. The hotel offers accommodation in 25 Deluxe, Super Deluxe, Premium and Executive Rooms and Royal and Family Suites. All guestrooms are equipped with split air-conditioners, living room, satellite television (LCD TVs), study table, daily newspaper, safe deposit lockers, tea and coffee maker, room heater, and intercom and direct dial telephones while sofa unit is available in selected rooms. The Royal and the Family Suite Rooms come with 32 inch LCDs. The Royal Rooms provide beautiful views of Shivalik Ranges and Rajaji National Park. Temptation is a centralized Air Conditioned, acclaimed multi cuisine veg. Restaurant, serving Indian, Chinese and Continental cuisines. For an unforgettable hospitality experience, Hotel Hari Heritage brings to you a bouquet of personalized services coupled with unmatched quality and distinct professionalism. Celebration is a Centralized AC Banquet with modern conferences, exhibition and Marriage Party facilities in Haridwar. - All statutory taxes/levies shall be payable extra as applicable. Strategically located at the natural utterance of Shanti Kunj and surrounded by mighty River Ganga and Rajaji National Park, Hari heritage is easily accessible from all the points of train, bus and air. Hari Heritage is conveniently connected with Jollygrant Airport (45 Min. drive), Haridwar Railway Station and Bus Terminus (15 Min drive).